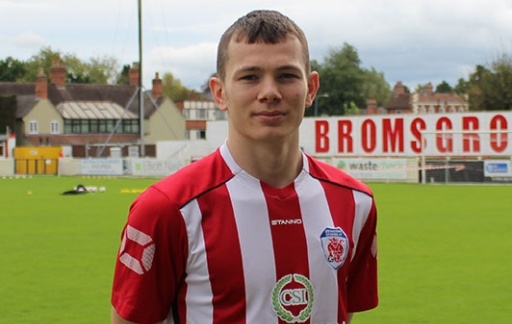 A DELIGHTED Jason Cowley admitted it was a good feeling to silence the Worcester City fans after his brace fired Bromsgrove Sporting to a 2-1 victory over the Blue and Whites. Cowley netted late on in each half to secure a precious victory for Sporting which moved them ten points clear at the top of the Midland League Premier Division table with five games remaining. Having been taunted by City fans on Tuesday night at the Victoria Ground, the soon-to-be Sporting all time top goalscorer told the Standard those jeers only added to his fuel to score. “I was getting stick all game from Worcester fans so I had to do my own celebration to shut them up,” he joked. “When fans are like that it just makes me want to score more just to silence them. “To get the first goal when we did was important but to score in front of the Shed End was a tremendous feeling. “To hear our fans scream when the second goal went in gave me goosebumps on my arms. Cowley now just needs one goal to equal the record set by Chrisi Conway for most goals scored in a Sporting shirt (70). And the former Redditch Borough hot-shot believes his recent fruitful spell has been aided by fellow strike partner Richard Gregory. “Me and Gregs have just bonded,” he said. “He is the best strike partner I have ever played with in my football career so far. “The link up play is just unreal. “Richard is a class player and his finishing is an absolute joke. Sporting now play five of the bottom seven teams, including the bottom three, to complete the campaign but Cowley stressed nobody can be taken for granted at this stage of the season. “Whether a team is playing for nothing or something, we cannot write anyone off in this league,” he added. “Everyone wants to beat us and only we can spoil it [winning the league].